달변가로 유명한 버락 오바마 美 대통령이 공식석상에서 박근혜 대통령을 “총리님"으로 불러 화제가 되고 있다. 25일 오후 (한국시간 26일 오전) 네덜란드 헤이그에서 열린 한-미-일 정상회담에서 오바마는 박 대통령을 바라보며 “마담 프라임 미니스터 (Madame Prime Minister)” 라고 지칭하다가 실수를 인지한 후 바로 ”마담 프레지던트 (Madame President)“로 정정해 눈길을 끌었다. 경색된 한일 관계 이후 첫 두 정상의 만남을 이끌어낸 오바마로써는 긴장할 수 밖에 없는 상황에서 나온 실수였다고 일부 언론이 보도했다. 핵안보정상회담이후 개최된 3자 회담은 오후 6시 35분부터 7시 20분까지 45분동안 비공개로 이뤄졌다. 오바마가 박대통령을 총리를 지칭한 부분은 비공개 회의 전 언론에 공개된 모두발언의 일부였다. 현지 취재진들은 공개석상에서 박 대통령과 아베 총리가 어색한 표정으로 일관했다고 전했다. 아베 총리가 이례적으로 한국어로 ”박근혜 대통령님, 오늘 만나서 반갑습니다"라고 인사를 건넸지만 어색한 분위기를 누그러뜨리기는 어려웠다고. 회담이 끝난후 가진 취재진과의 브리핑서 민경욱 청와대 대변인은 “과거사 얘기는 아예 안 나왔다”고 밝혔다. Obama mistakenly refers to Park as P.M.
U.S. President Barack Obama must have been under pressure. He made an unusual slip of tongue, calling South Korean President Park Geun-hye “Madame Prime Minister” during trilateral talks with the leaders of South Korea and Japan. Obama brought the leaders of the United States’ key Asian allies to the same table on the sidelines of the Nuclear Security Summit in The Hague, Netherlands, Tuesday. Park and Abe have barely been speaking each other since they each took office about a year ago, due to frayed diplomatic relations between the two countries. It was their first face-to-face meeting since coming to power. 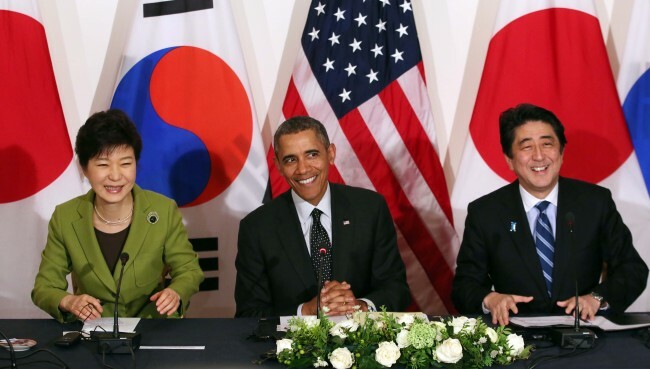 Reports say Obama referring to Park as P.M. shows that he was intimidated by the awkward mood that prevailed throughout the three-way meeting.